These easy orange creamsicle bars taste just like your childhood but with no added sugar! A wonderful low carb summer treat. This post is sponsored by Wholesome Organic Stevia. I love this time of year, I really do. Towards the end of spring and on the cusp of summer, there’s always this excitement in the air. Kids looking forward to the end of school, working folks looking forward to some vacation plans, everyone looking forward to hitting the pool or lake or ocean or stream. Everyone trying to be outside a bit more, soak up some sun and enjoy the more moderate temperatures before the real dog days of summer hit. And the world is green and beautiful…flowers and trees are blooming, berries are ripening, and everything feels alive with possibility. And for someone who loves to cook and bake, the change of seasons brings its own special excitement. 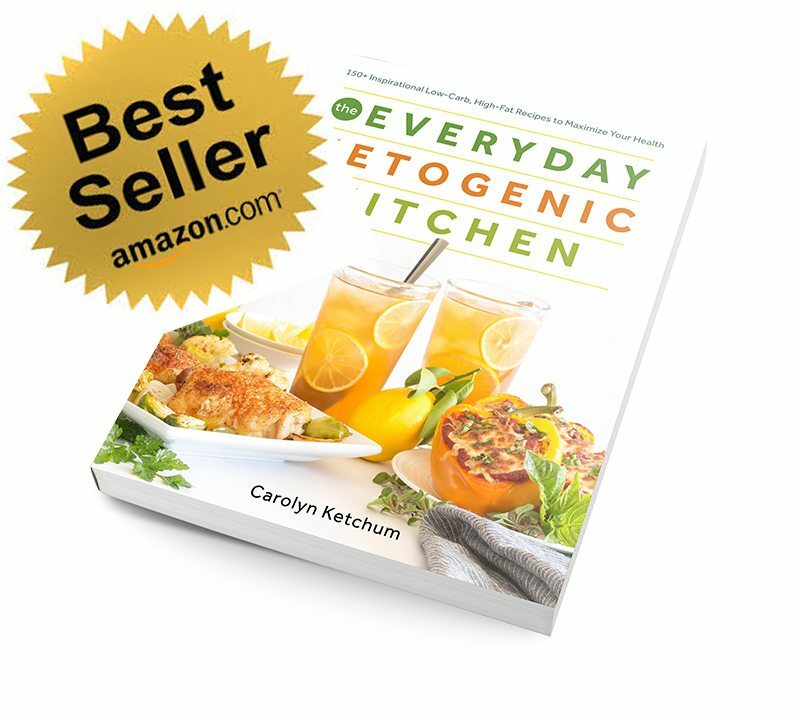 You’ve sloughed off the heavy foods of winter, and are ready to enjoy the bounty of late spring and early summer. Your mind shifts away from soups and stews and other comfort foods, and begins playing with lighter flavours, things that make the most of fresh produce and taste like summer. And if you happen to have a nostalgic streak, as I do, you love to create treats play off of the tastes of your childhood. Like creamsicles. What kid didn’t love hopping on their bike and riding down to the local convenience store to grab one of those orange popsicles with the creamy vanilla center? I was asked to try out Wholesome® Organic Stevia and to incorporate it into a spring or summer recipe. With my mind abuzz with summery food ideas, it was tough to choose which direction to go. But a few lovely recipes for creamsicle bars caught my eye. Of course, they were made with plenty of sugar and wheat, but I knew that with a little low carb sweetener and some almond flour, I could re-make them into a healthier summer treat. One that tasted like my childhood but without all the sugar. I was very impressed with Wholesome Organic Stevia. 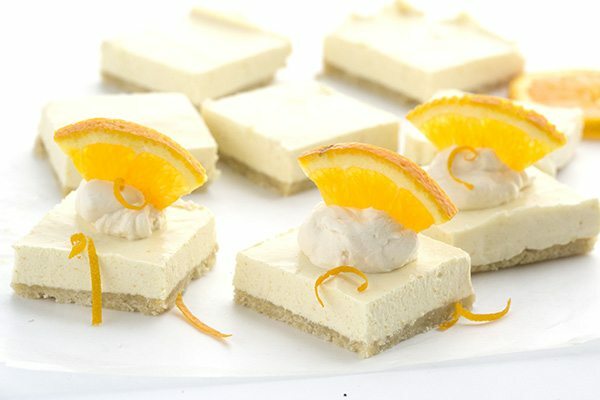 It combined perfectly with both the crust and the filling in these no-bake creamsicle bars, and there was no grittiness. It’s entirely organic, non-GMO, vegan and kosher and it doesn’t spike my blood sugar one little bit. I also love that Wholesome Organic Stevia comes in the little packets and in larger containers…I have a convenient new way to sweeten my summer drinks on the go. As the weather warms up, I think I will be carrying them with me everywhere. Wholesome Organic Stevia is available at Whole Foods, Target, HEB (Texas), Wegmans, Meijer, Sprouts, Amazon or in Wholesome’s NEW online store. 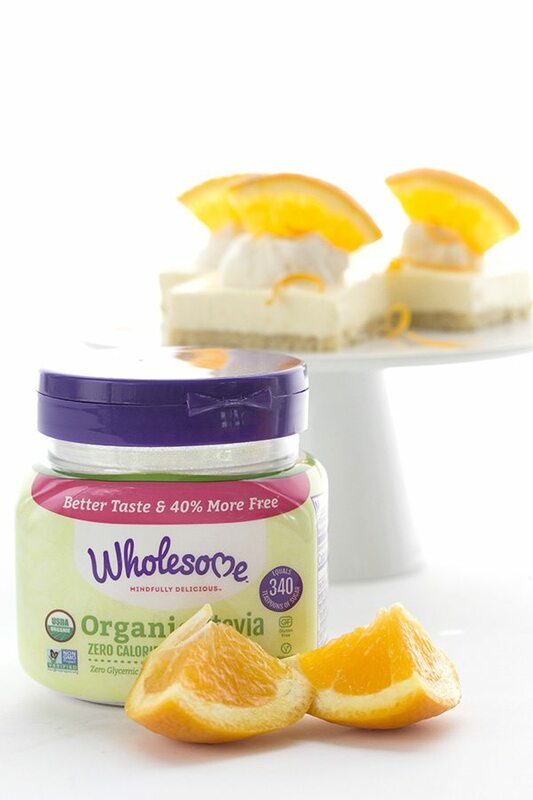 Grab this coupon for $1 off Wholesome® Organic Stevia and make your summer the sweetest yet! 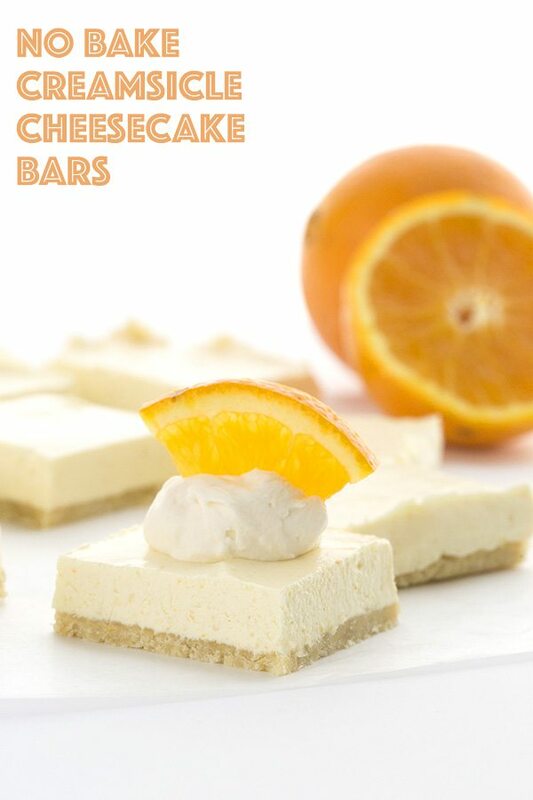 These easy orange creamsicle bars taste just like your childhood but with no added sugar! 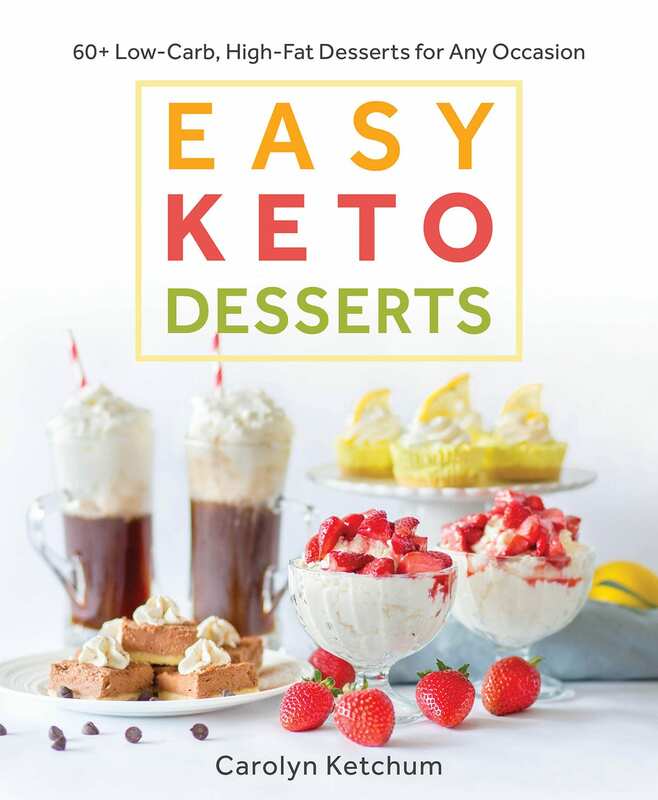 A wonderful low carb summer treat. Line a 9x9 inch baking pan with parchment paper, with an overhang for easy removal. In a medium bowl, whisk together the almond flour, stevia, and salt. Stir in the melted butter until the mixture begins to clump together. Turn out into the prepared baking pan and press firmly and evenly into the bottom. 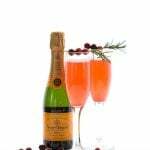 Use a flat-bottomed glass or measuring cup to even it out as much as possible. Freeze while making the filling. 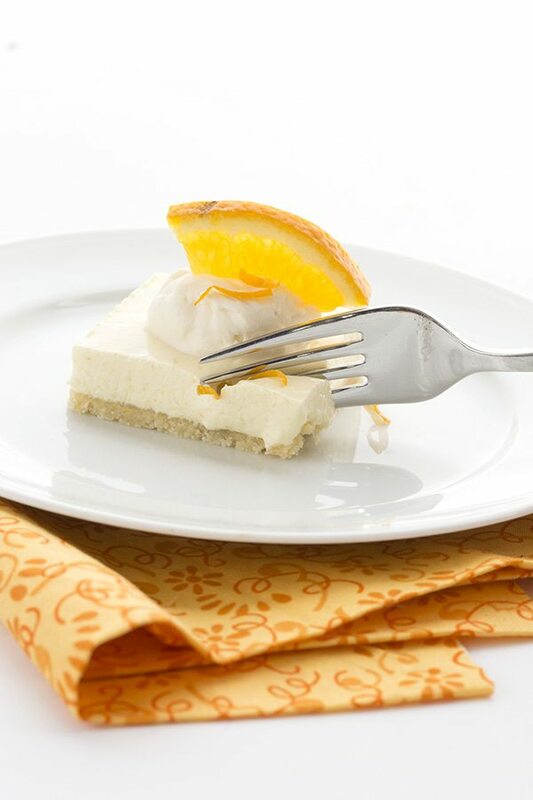 In a food processor or high-powered blender, combine the cream cheese, sour cream, orange juice, orange zest, stevia, vanilla extract and orange extract. Blend until smooth and well combined. Taste mixture and increase sweetener if desired. Sprinkle with gelatin and blend again until smooth. Pour the mixture over the crust and spread evenly with an offset spatula. Chill until firm, about 4 hours. If you want it to set faster, you can freeze it for a few hours. Use the parchment paper edges to remove from the pan. Cut into 16 squares. Don’t buy a carton of OJ, just buy a single orange. That way, you can use both the zest and the juice from it with no leftovers. While I like orange extract and there is some in here, real orange zest and juice gives it the best flavour. How do you store leftovers in the fridge? Do you cover it – does condensation occur if you do? Been a long time since I’ve done cheesecake and I want this one to be SPECIAL ! Thanks ! I kept them in the fridge but actually they were uncovered, just in the pan. They did fine for 3 days. The nutrition facts are per serving but I don’t see how many servings are expected. You could divide a 9×9 pan into 16ths or 9ths or …? Sorry, that got missed. 16 servings and I’ve added that in now. I think it would be nice if you actually defined a serving size because you can’t really tell what the carbohydrate number is unless you prepare the dish cut the pieces and then do the math so it all seems a little bit loose eGo-C. The recipe however really looks delicious and I agree with all your techniques, like the lady above I would probably want to experiment with orange oil or extract and then see how it worked with orange juice. It can’t hurt to try it twice! Sorry, yes. It serves 16 and it’s supposed to say that at the top, I must have missed putting it in. But a square pan like that typically makes 12 to 16 and I always cut mine into 16. I am off to fix that now! I am still confused….so one serving is how many carbs? Thank you…. 4.07g per bar. It makes 16 bars. Yes, absolutely. I rather expected to be asked that! The crust will take 1/4 cup powdered Swerve and the filling will take about 1/2 cup to maybe 3/4 cup powdered swerve. Adjust the sweetness of the filling to your liking. I’ve had the same experience with Stevia. I’ve not tried the brand she used because I’ve never seen it in the stores, but sweetleaf brand stevia is really good! I can get the packets in the store, I order the bottles online, and can get organic as well. Can I use Swerve instead of Stevia? If so, how much? 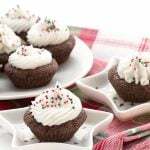 If making these for a sugar-friendly crowd, any suggestions on how best to sub out the stevia? Sure. About 1/4 cup powdered sugar in the crust and 1/2 cup powdered sugar in the filling. Could this be made into 16 cupcakes instead? I’ve made the Kentucky Butter Cake and the Trimtastic cake (from the THM cookbook) into cupcakes with great success. I have parchment liners to line the muffin pans. Thanks for your reply! Another question, I use Pyure, do I measure the same as Stevia? No, I don’t think it’s as concentrated. 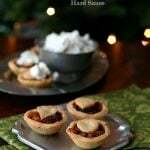 The amount of Wholesome stevia I used for these comes to about 1/4 cup sugar equivalent in the crust and 1/2 cup sugar equivalent in the filling. 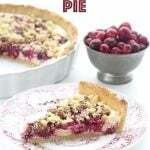 Pyure is about 2x as sweet as sugar so you’d need 2 tbsp in the crust and 1/4 cup in the filling. You know I eagerly await your creative recipe genius, right?! 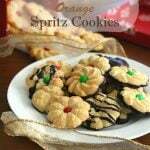 Made these the day the recipe was posted (even sent hubs to store for Valencia oranges)! Had to throw the entire pan down the disposer. So, so bitter. Ya’ll’s Stevia taste buds are definitely a different breed than ours. 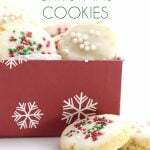 Will try again soon with Surkin confectioners…love the ease of your recipes as always! Up next, those cheesy garlic bread muffins….. The ingredients list on the Wholesome Organic Stevia begins with Blue Agave Inulin, followed by stevia, so it is not a straight stevia product, but a sweetener blend. It seems silly to me that companies that make low carb sweeteners and treats just cannot come right out and say they are making a blended sweetener product! We all do it in our own kitchens and appreciate it when a ready made product makes less work for us!!! Best of luck the 2nd time! 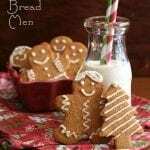 That flavor always takes me back and I can’t wait to make these for my boys! I assume I could do this with lemon? I LOVE Wholesome! And creamsicles! These bars have my name all over them! 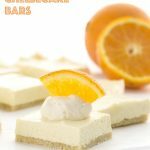 My kids are obsessed with creamsicle smoothies right now – they would love these bars!! These sound so perfect for summer! Ah, I used Frontier orange extract so that might be part of the difference! Thanks for the tip. Is this what you use? It seems to be called “flavor” rather than extract here, so I might have the wrong product. Thanks for all you do! Possibly you’re on to something. That is the extract/flavour I used. I made this substituting lemon juice (didn’t use any extract) and used Serve. It is SOOOOO good. Could I possibly use coconut flour instead of almond? Only because I have that! Coconut flour does not make a good crust like this. Is there any other flour that could be used for the crust? 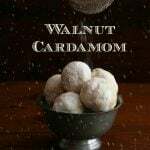 I have tree nut allergies, can’t use any tree nut flours?. Have you ever tried sunflower seed flour? Thank you!!! These turned out DELICIOUS and my Dutch boyfriend loved them. 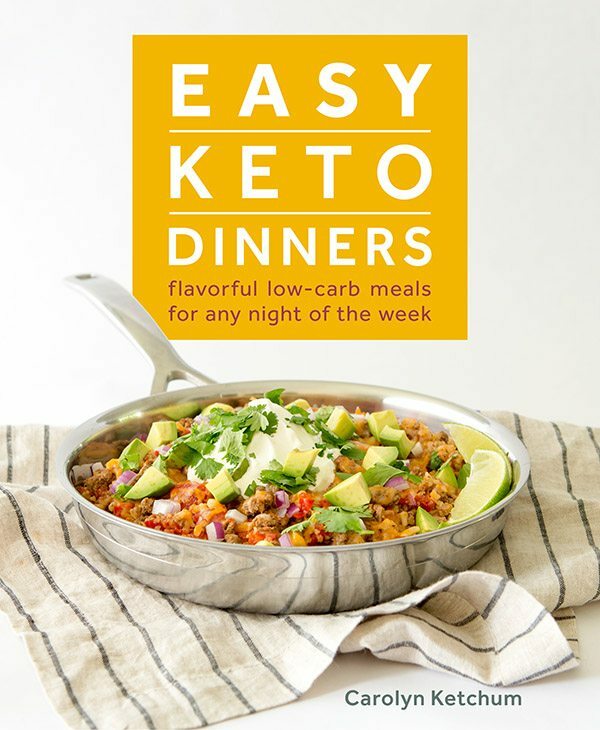 I am a newly diagnosed Type 1 diabetic and your recipes are helping me so much. So thankful!!! 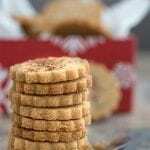 Iam so frustrated.I cannot eat almond/nut flours.will coconut flour work? Also do u have any recipes w coconut flour? And can this be made to the crust and frozen into pipcycles? I sincerely thank you for your answers…. I have a lot (and I mean A LOT) of coconut flour only recipes, including my recent keto bagels recipe. Search my blog. Unfortunately, while it makes for great cakes and donuts, coconut flour doesn’t make very good crusts or cookies. 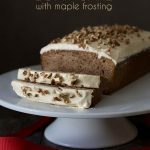 Could I sub 1/3 less fat cream cheese, and fat free sour cream for the full fat versions? Can you clarify the type of gelatin you used? I am assuming it is the kind that gels up; ie the orange can from Great Lakes. I have both the green and orange cans and I don’t want to use the wrong one. Thank you. Hi Patty…the orange can, yes. The green can is collagen so they are not both gelatin. Hope that helps! I am looking forward to trying this in lemon. I bought Stevia liquid when I first started eating the Atkins way in 2000. It was quite pricey and HORRIBLE! I think I was so happy to give it to one of my friends who thought she was going crazy and thought it was because of sugar. She liked it. So glad. I didn’t even ask for any money, it was about $30. That was a lot for just some sweetener back then and now. I have Swerve on order from Amazon. Should get it by this Tuesday. I will then purchase a couple more lemons, wasn’t sure we could even use lemon juice. I have been using limes with 100% coconut milk, 2 Splenda packets, 1/3rd cup of fresh squeezed lime juice, 1 tsp lime zest, a cup of ice and blend it like crazy. Oops, I forgot, you can either top it off with soda water of do like I do, I take 2/3 cups of chilled Patron Silver Tequila. Makes or a super creamy, drink. I love Patron Silver tequila, or you could use vodka, or rum, or just after blending, just op it off with soda water. Your choice entirely!!! 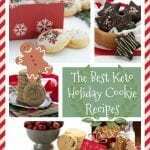 Thanks again for these great recipes. I think I may be able to continue eating this way for a lot longer than 2 years, which is what I did last time. I love meat, and the fattier cut of ground beef is not only better for you, it has a better flavor than the low fat kind. Yes, I am a CARNIVORE!!! OMG!!!! 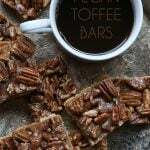 I made this recipe for dessert after Father’s Day dinner and it was so AMAZING!!!! It was also super easy to make. I will definitely be making this again!! Great flavor! I had no issue with bitterness as a result of orange extract, and no problem with using Swerve. However, they did not set up as much as I would have liked, and I am guesting this is a result of my using Knox gelatin instead of the grass-fed you recommend (which I cannot find so need to order). Can you offer a suggestion for using the former instead of the latter? Thanks! Well Knox gelatin also needs to “bloom” to work properly so it’s a very different process when you add it. Maybe you just needed a little more of it? Actually, by freezing then allowing to thaw before serving, it did just fine. But next time I will add a bit more. I made a sugar-free coconut chocolate sauce that I drizzled on top then added whipped cream – yum!